The Index opened negative and stayed weak throughout the entire session of trade to close near the lows of the day at 8370.25, huge loss of 88.70 points. The broader market was also weak, with 568 advances to 915 declines. Range as per Option Table till expiry is at 8000-8500. Call option 8350-8500 added huge 29.06 lacs OI with profit booking seen at 8600 and above strike prices. 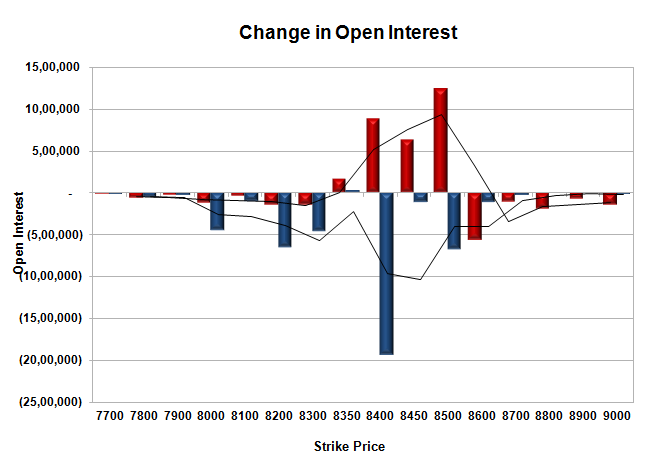 Put option 8350 added 0.19 lacs OI with short covering seen at 8400 and above strike prices. Nifty Open Interest is at 1,19,15,150 down by 9,50,300, whereas June series added 6.81 lacs with decrease in price, most probably rollover with huge long liquidation. Bank Nifty Open Interest is at 16,23,525 down by 1,49,475, whereas June series added 1.52 lacs with decrease in price, most probably 100% rollover with small short build. 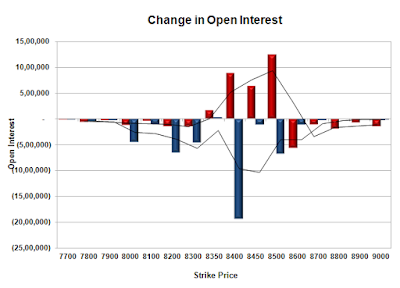 FII’s bought 0.54 lacs Futures, which includes 888 contracts long build-up and 1271 contracts short covering, with decrease in net OI by 383 contracts (includes 115594 longs to 113435 shorts for the day) and the Average Price comes to 8912.54. FII’s Index future open contract as on date is 330645 Longs to 316356 Shorts, Net Long 14289 contracts. 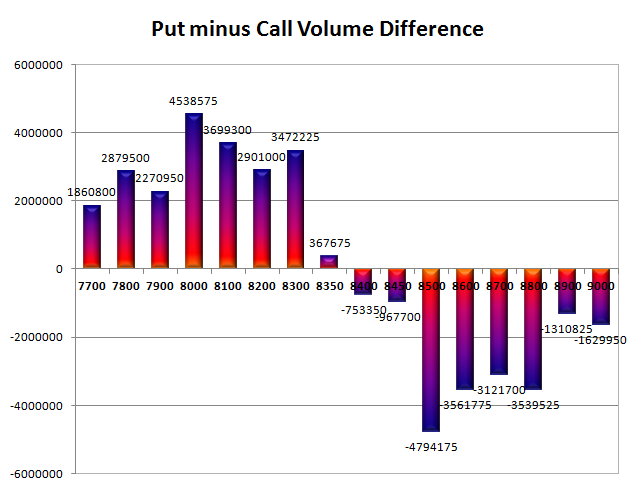 Initial and best support at 8300, with OI of 52.42 lacs and below that at 8200 with OI of 42.57 lacs. 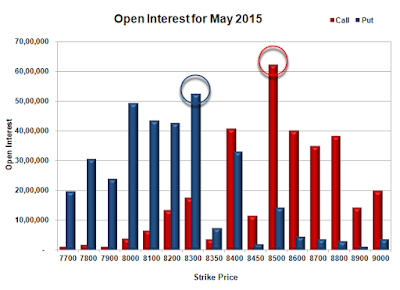 Initial resistance at 8400, with OI of 40.70 lacs and above that at 8500 with highest OI of 62.22 lacs. Day Range as per Option Table is 8309 - 8463 and as per VIX is 8296 - 8444 with 8392 as the Pivot.